In our 34 years in the business, Sports Card Collecting has never been Hotter. Baseball, Basketball and especially Football demand has greatly exceeded supply, resulting in all sports card box prices going up on a daily basis. 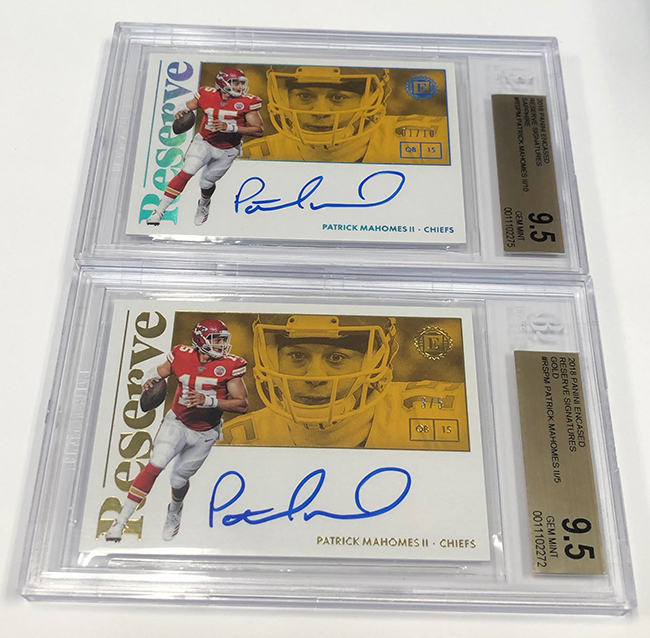 High singles sales prices for Luka Doncic, Trey Young, Shohei Ohtani, Aaron Judge, Baker Mayfield, Saquon Barkley, Lamar Jackson, Josh Allen, Sam Darnold, Josh Rosen, Tom Brady, Patrick Mahomes, have caught the attention of sports fans and converted them into new collectors and has brought back lapsed collectors to the hobby. With the 24/7 access to the internet/social media, collectors, new and old can check the up-to-the-minute values of their favorite singles and box products. The internet/social media has also spawned a new form of retail sales, The Group Breaker. This real-time reality show of retailing has resulted in large amounts of product being consumed in a very small amount of time, which then becomes many thousands of singles on the secondary market on release day. The Group Breaker then goes back to his distributor/supplier for more product. The supply/demand factor results in product price increases which are then passed on to you, the consumer. The more you buy, the more prices go up until we reach the point where the consumer says, "No, that's too much" and stops buying that product in box form. But, the "Group Breaker Spots" in their many forms (by team, player, number, and many others) mask the consumer's risk/reward costs and the consumer continues to buy-in as box cost increases are passed on to them in these forms. Eventually, Group Break spot prices reach the point where you say, "Too much." One might think the solution to high product prices is the card manufacturers need to make more product; well, they have but in a responsibly controlled manner so as not to over-saturate the secondary market with single cards. It seems that everyone, especially the new and returning collectors are looking to buy the same few stars/rookies (above list). While these few stars/rookie prices are sky high, there are many overlooked cards that are under-priced and real bargains for the knowledgeable collector/investor. Some day, card flippers (people want to sell their singles right away to recoup expenditures) will hold on to these under-priced cards. Until then, if the manufactures were to increase production by too much, the secondary values of all their cards would drop and discourage people from buying more singles/group break spots/boxes/cases. People would leave the hobby as quickly as they have entered. So, what is the case? Are box prices too high? Are Group Break Spots too high? Are Hot Rookie prices too high? Are talented second tier rookie prices too low? In the end, you the consumer/investor have the answer. The retailers and manufacturers react to your buying habits. What? I say you have the answer and you are looking to me for an answer. Having worked with collectors and investors for over 34 years, I can only give you advice. My advise for the collector (person who keeps cards) has always been, "Buy what you like. Don't follow the crowd." My advice for the investor has always been, "Don't be influenced by your own likes/dislikes. Get in the minds of the crowd. Buy and sell to the whims of the crowd. Look for buying opportunities. Stay true to the investor mantra. BUY LOW, SELL HIGH." My advice for everyone who enjoys busting boxes, "BUY EARLY. Prices are not going down."